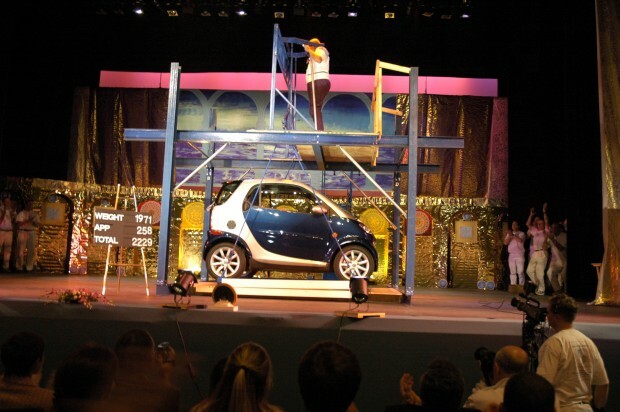 Sri Chinmoy lifts his 2200 pound Smart Car. Sri Chinmoy’s weightlifting defies belief. It doesn’t seem possible to lift the weights he did, especially considering that his two-decade long weightlifting career only began at age 54. He made the impossible not only possible, but Chinmoy furthermore, suggests that we can do it too! This is the uplifting message of Challenging Impossibility, a documentary that premiered at the 2011 Tribeca Film Festival.Spiritual-master-turned-strongman Sri Chinmoy, who passed away in 2007, is shown lifting not just weights but aircraft, elephants, cars and a who’s who of 20th Century luminaries including Nelson Mandela and Sting. By doing so, the Indian-born poet born again as powerlifter challenged impossibility itself.